Celebrating TMF University’s renewed focus on taking TMF action, LMK is happy to present this how-to blog post, the second post in a multi-week how-to series. You can read the series’ last post here. In the coming weeks we’ll dispense with complexity and focus on what it takes to achieve a basic TMF skill we think every clinical research professional should know. What: What is a TMF Filing Level? A document’s TMF Filing Level is a type of metadata. Metadata is information attached to a document’s file that isn’t the document itself. A document’s TMF Level represents its place in the hierarchy of clinical trial conduct. This hierarchy (Trial Level, Country Level, and Site Level) reflects how authority is delegated within a trial and reflects the natural divisions between the trial activities and documents produced by the trial site, the regional or country offices of the Sponsor, and the Sponsor’s global headquarters. In the past, when trials were conducted with paper TMFs, the TMF would, by necessity, be divided into three sources (site, regional office, and sponsor’s headquarters) and only become physically combined at the closure of a trial. Now, with modern eTMF systems, documents can be accessed by anyone at any time. But, although documents are now freed from physical limitations, modern eTMF systems and the TMF Reference Model still preserve the distinction between these three sources of documents (which we now call levels) because of their importance in organizing the TMF. A document’s TMF Level, regardless if paper or electronic, conveys important information about to whom a document applies, for what purposes it was created, and where the document came from, and is therefore an important dimension of the TMF Reference Model. Trial Level: Documents filed in the Trial Level impact the widest number of stakeholders. Trial Level documents tell the story of the key management decisions of a trial. They may also act as the basis or master template of documents that are customized at Country or Site Level. Documents that show the results of a trial (like the Clinical Study Report and tables, listings and figures) will also be filed here once the trial has ended. Country Level: Often containing the fewest number of documents when compared to the two other levels, documents filed in Country (or region) Level are often related to regulatory body submissions. Commonly filed country level documents include ICF master templates customized for a country, and regulatory body submissions and supporting documents, such as an MHRA approval or EudraCT registration document. If the trial occurs in one region or country, especially if the trial is small, the Country Level may be merged into the Trial Level. Site Level: Documents filed here were produced by a trial site or are customized for use at a specific trial site. Common examples include documents that are part of the regulatory packet (CVs, 1572s, and Medical Licenses) as well as IRB approvals specific to the site. Trial and Country Level document templates customized for a specific site would also be filed here. 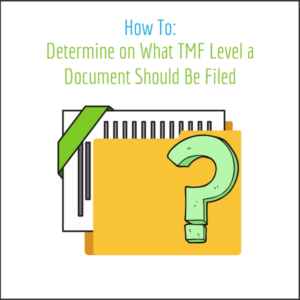 Who: Who decides what the correct TMF Level is for a document? As discussed in the last how-to post, the TMF Reference Model is an open source industry-developed guideline and is not a regulatory requirement. The following guidance is given in the TMF Refence Model User Guide regarding TMF Levels: “It is important to note that artifacts should be filed at the most appropriate level, based on the content of the record.” The TMF Reference Model is not a one-size-fits-all solution. Just as study-specific circumstances can make determining the correct zone, section, or artifact a challenge, so too can study-specific circumstances impact a document’s TMF Level. When struggling to determine a TMF Level, it’s best to seek more information from a subject matter expert. Sometimes you may even find a document can be filed in multiple levels. For this reason, it’s crucial that your TMF plan provides enough detail to ensure consistent filing practices across your whole team. More than just the identity of a document presented through its zone, section, and artifact, the TMF Level offers the ability to encode information about a document’s hierarchy. It is, however, only a tool, and no substitute for knowledge of the unique circumstances of a trial. 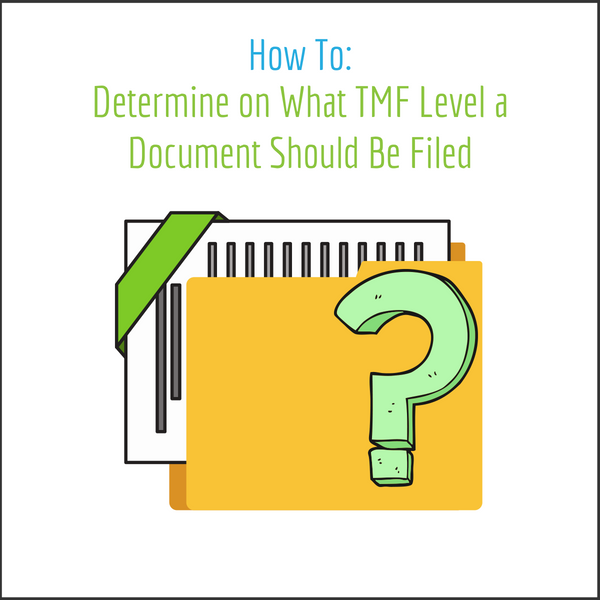 Ultimately, it’s your responsibility to decide on what TMF Level a document should be filed. A document’s TMF Level is a helpful signpost, but it’s still up to you to choose your destination.